Blue Jeans Network is a fast-growing cloud-based service that is reshaping business video collaboration. The company you see today has come a long way since its speculative origins, and almost blew up on the launch pad. Blue Jeans’ founder / CEO Krish Ramakrishnan has an uncanny ability to detect fuzzy, early market signals and turn them into strategy. I first met Krish in 2001 when I recruited him to lead Topspin Communications. Topspin was originally conceived as a “Content Engine” for use in CDN’s and web publishing infrastructure, but within months of joining Krish realized the dot-com crash had pushed this market out several years. Despite such bad early news, Krish was unflappable and completely retooled the product plan around a new type of server-side switching. In the process the team invented what later became known as I/O Virtualization. Krish knew that the server giants would eventually play a decisive role in this nascent market, and ran the table landing OEM deals and strategic partnerships with IBM, HP, Dell, NEC, NetApp, Oracle and others. 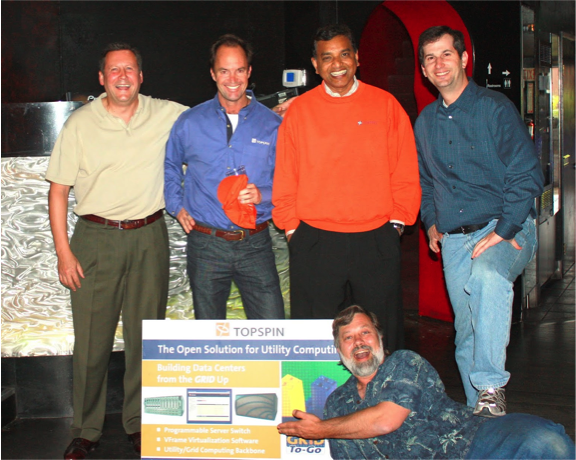 Soon Topspin had established itself as the critical piece of the I/O Virtualization puzzle. The company was eventually acquired successfully in 2005 by Cisco, who had noticed Topspin’s steady penetration of major enterprise computing grids. The sale decision was a difficult one, and I initially opposed it. But the team sensed that its Infiniband-centric ecosystem was a fragile one, and market uptake was dampened by customer concern over the future of this technology. Some of the concepts pioneered by Topspin, including the dynamic resource management capability of its VFrame software, later came to life within Cisco’s virtual data center strategy. We had clearly been just a bit ahead of our time. Krish ran the Data Center Business Unit at Cisco for several years, and then re-joined me in 2008 as an Entrepreneur-in-Residence. He started with the big-picture notions of video communications, cloud-based infrastructure, social adoption drivers and business customers. We iterated together to fill in the blanks. Along the way we met Alagu Periyannan, a brilliant technologist with deep experience in online video and security. He and Krish were perfect complements, and together they developed a plan for a cloud-based video collaboration service with unprecedented simplicity and universal reach. We took this plan before my partners at Accel in early 2009, but the group was uncomfortable and would not move ahead with a financing. Krish and I sat in my office together after the meeting and struggled to decode the sometimes-conflicting feedback. It was back to the drawing board! The team spent the next several months narrowing the Release 1.0 product scope and reducing capital requirements. Meanwhile, the clouds of the financial crisis were slowly clearing, boosting investor optimism. When we took “Blue Jeans Version 2” back to the partnership, we were this time successful in winning the group’s support. I ended up leading Blue Jeans’ Series A financing later in the year along with co-investor Matt Howard of Norwest. Strategic flexibility is one of Krish’s great strengths, and there have been many twists and turns on the Blue Jeans road. The company initially emphasized its Skype-compatibility, but has since seen users gravitate to its own endpoint application. We had also intended to emphasize direct-to-user / line-of-business in our marketing and sales, but soon learned that IT would remain a key decision-maker. Interestingly, as Blue Jeans has scaled, more and more sales have tended to be LoB-driven as we had originally postulated. The product itself has also seen a rapid evolution, including instantiations as a cloud-based MCU (“Video IaaS”) as well as deep enrichment of application features and proliferation of supported platforms including mobile. The team relies heavily on its own data science capabilities to make these product decisions and optimize its sales and marketing process, a far cry from the seat-of-the-pants choices of a prior era. Today Blue Jeans has emerged as the clear next generation leader in business video collaboration, a horizontal opportunity of breathtaking scale. User needs are becoming clearer, incumbent vendors are thrashing as they try to keep pace, and new would-be challengers are emerging constantly. In such a complex and changing ecosystem, Blue Jeans’ most decisive asset is its ability to set its category’s agenda while purposefully evolving itself. Not many companies have this gift of strategic flexibility, but Blue Jeans was born with it, an inextricable property of the founders’ core DNA.